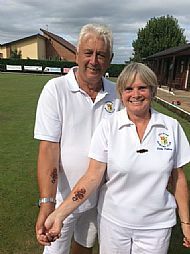 Sally and Keith Pulling were a matching pair with their new dragon tattoos at the Ken Ryall on Saturday 11th August. "Always hungry, a Western dragon will eat anything, but especially likes weak, young, human flesh” – so Hailsham bowlers can rest easy. "Don't mess with the girl with the Dragon tatoo". "Are you allowed pets on the green?" Ten bowls, two jacks and one bowler. What can you come up with for Goldie's photo? "Sneak preview from the remake of ‘Callender’s Girl’ . . ."
"I've looked under the other nine, so it must be this one"
You are an imaginative bunch. Here are some of the printable captions. "Ah, actually, when I said I had a bucket list . . ."
"I think they are digging for bait!" "It's okay Fred. We've caught it!" "A whiter shade of pail"
"Right said Fred. Both of you together. One each end and steady as you go."